Over the last two days I completed the build of this new machine. As it’s a clean machine as explained in my last post, it won’t need drip trays to collects water or anything like that, so it was decided that the machine would be mounted direct to the bench in a static position. This cut down on material costs as I didn’t have to construct a top, back and base for the machine as the bench top would be the base of the machine. The first job was to cut two blocks to mount the bearings on which I got from my scrap wood pile which would otherwise have been destined for burning next winter in the fireplace. The two blocks were positioned on the bench top and then wood glue was applied for extra strength and a couple of screws were put in from underneath the bench to pull the joint nice and tight and hold the blocks in place. 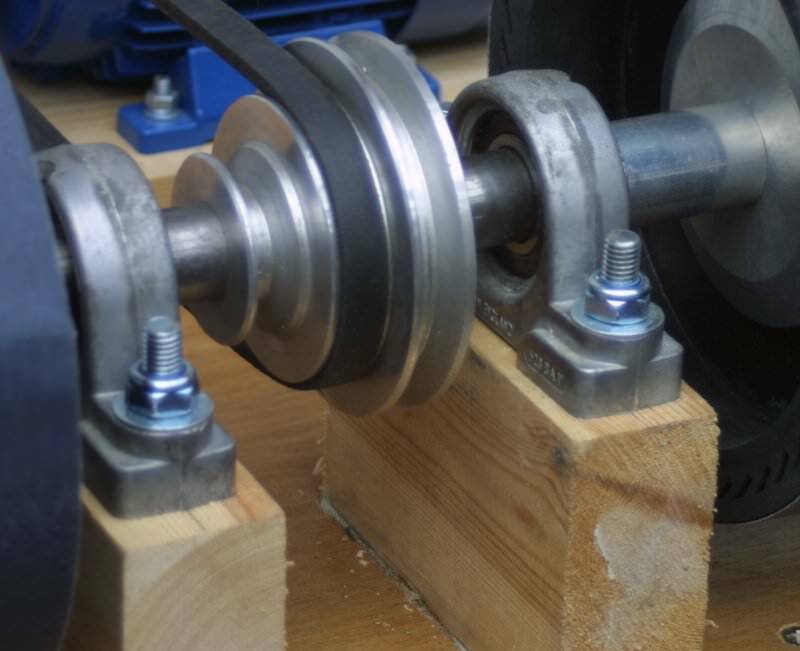 The next job was to place the bearings and shaft assembly on the blocks and position them, these were temporarily held in place with four long wood screws. Now I slackened off the grub screws in the bearings and the pulley, so I could get the shaft in the correct position, i.e. equal lengths on each side, once that was right the grub screws were clamped up. Now I removed one of the four wood screws, leaving three in to hold everything in place while I drilled the first hole for the bolt that would go from underneath the bench top up to the top of the bearing, I did these one by one, fitting a bolt as soon as a hole had been drilled. By doing it this way everything stays in place and you can’t end up with a hole drilled in the wrong place. Yes it could be argued that by measuring everything accurately the same result could be achieved, but I believe by using the method I did then there is no chance of an error occurring. So now we have the bearing and shaft assembly firmly secured to the blocks, at this point I realised my first mistake, I had forgotten to fit the V belt, but fortunately this was an easy omission to fix by simply unbolting it all, fitting the V belt and then bolting all back up again. 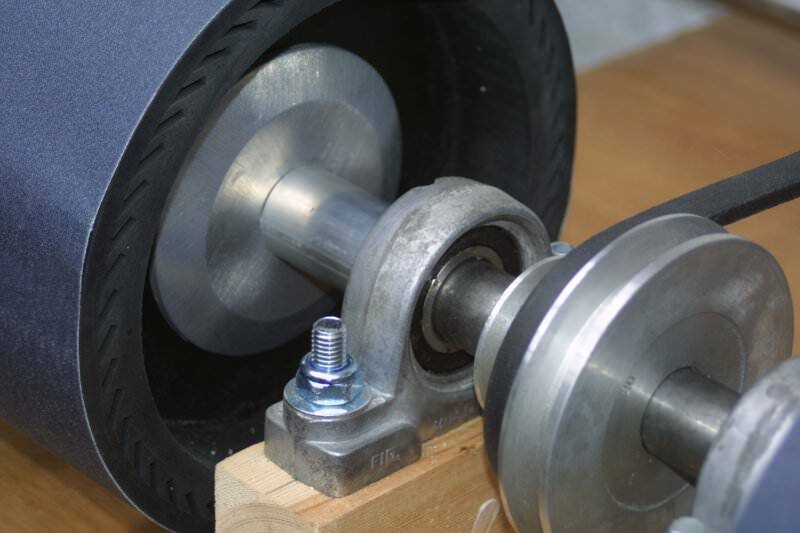 Next up was to make the spacers between the wheels, to do this I fitted all of the flanges and wheels and spaced them out how I wanted them, once I was happy with the spacing I marked the shaft against the edges of the flanges with a marker pen. 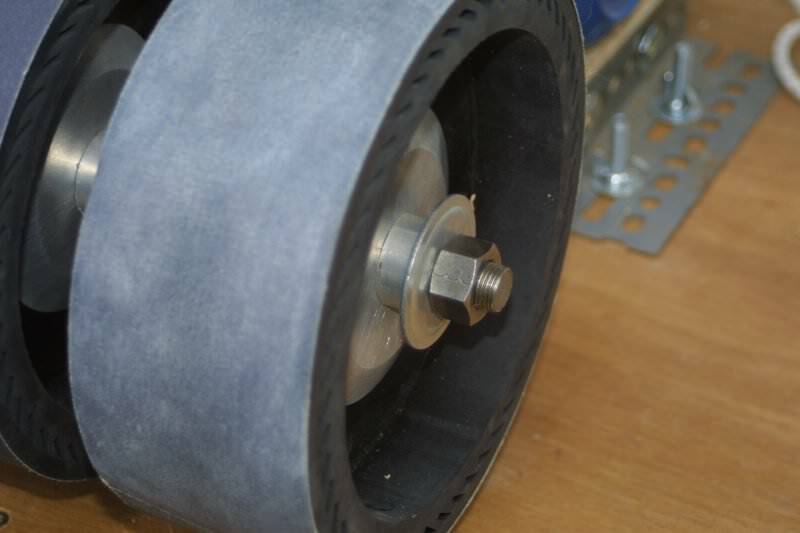 Now all that remained was to remove all the wheels and flanges again and then take some measurements. The first measurement was between the face of the bearing and the first mark on the shaft, this would be the size of the first spacer. Now I have got my spacer measurement, I went and cut the first two spacers, one for each side. I have used some aluminium tube for the spacers, it has an inside diameter of 26mm with a wall thickness of 3mm, so the dimension are pretty near perfect. Right back to the shaft now and fitted the first two spacers, one each side butted up against the bearing face, then slid a flange on each side and then a wheel on each side, followed by a further flange. Now I took the next measurement for the next spacer which would go between the flanges. 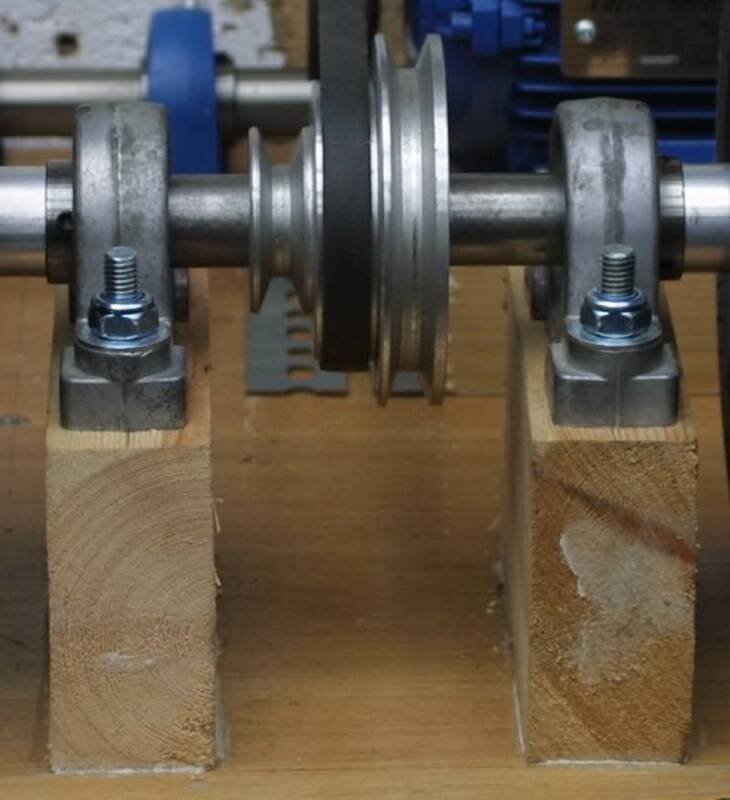 With next two spacers cut they were fitted onto the shaft on each side, followed by a flange each side then a wheel each side and then the final flange each side, and now it was time to measure the final two spacers. These I made a couple of mm longer than the measurement as I wanted to make sure everything gripped properly once tightened up. Next I tightened the nuts at each end of the shaft and that was that stage of the job complete. 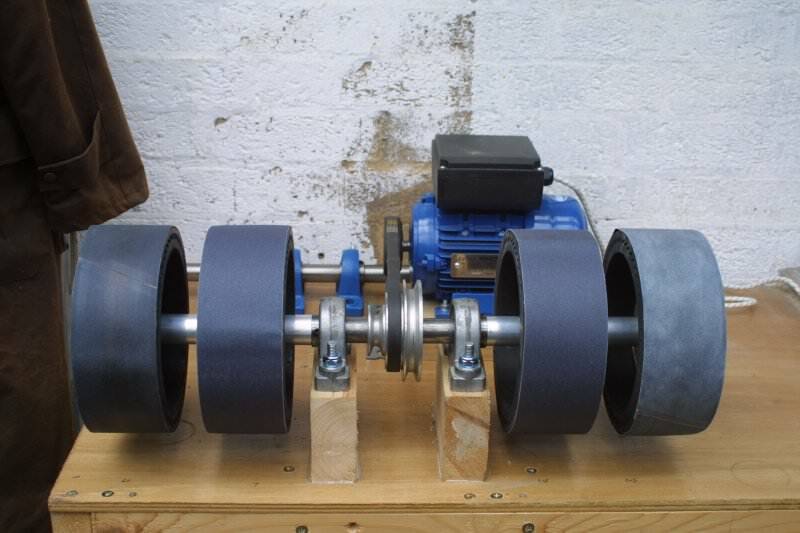 The next stage was to make the motor mount, this is just a lump of scrap wood again which the motor is bolted to. When I built my first machine a few years ago I spent quite a while working out how I could make a motor mount that was adjustable to take account of any belt stretching that might occur and still be able to maintain a good belt tension. The result of deliberations again came from my scrap box which can be seen in the photo. I think this metal is called Dexion, but the fact that it has long slots in it gave me the answers to my initial problem. 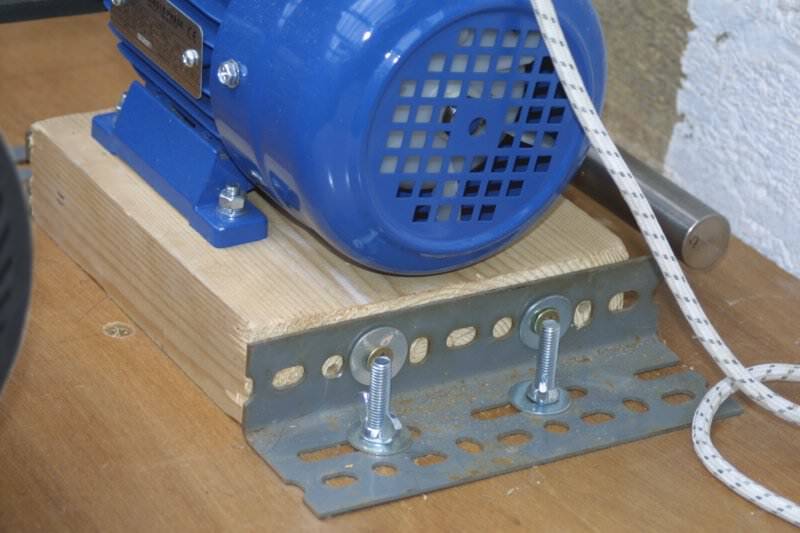 So as you can see, the metal is screwed into the wooden block that the motor is mounted on. Then I placed the motor in position and put the V belt round the motor pulley and got everything lined up and then marked four holes in the bench top. These would be for the four blots that would go through the long slots in the metal. With the holes drilled, the bolts were glued in place from underneath and then the motor was put in place and wing nuts screwed onto the blots, and there you, my simple adjustable motor mount and it really works! Now I took the time to check everything was secure and tight before firing the machine up for the first time. I almost forgot to mention that you must never run expanding drums without belts fitted. So here we go, with on time and blast off, I was horrified to see that the whole thing vibrated like mad on initial power up. I soon realised it wasn’t the machine that was at fault, it was the bench, it was too flimsy, the bench top was bending under the inertia of those wheels spinning up. 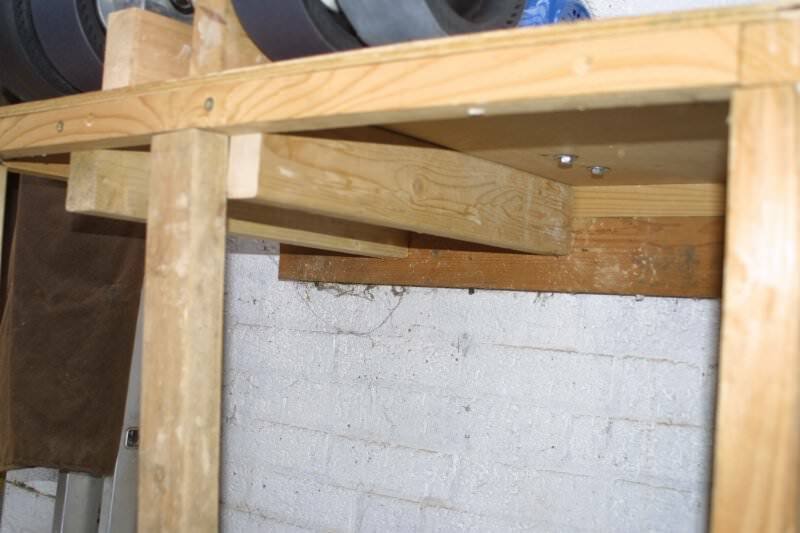 So now the bench had to be stiffened up considerably, back to the scrap wood were I five lengths of wood, two of these would be screwed under the bench top as close the bearing bolts as possible, once theses were fitted the bench top was much less flimsy. 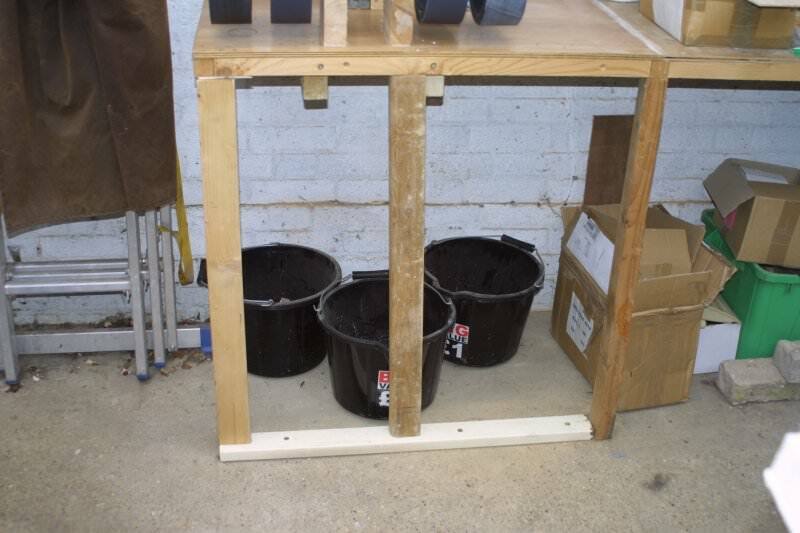 But, and there always is a “but” isn’t there, I realised that the bench legs were not secured to the floor of the workshop and that this would allow some vibrating so that would need addressing too. The four wheels are fitted with REZ belts, these are resin impregnated belts which have the diamond paste applied to them. We will be using the following grades of diamond on the belts 28, 7, 2.5 and 0.5 micron which should give us a good coverage to follow on from the 600 grit silicon carbide belt on the other machine. We got a very good result on a piece of lapis last year when we used the 0.5 paste, a result I couldn’t get with cerium oxide, so maybe we won’t be using cerium oxide very much in the future. Our next job will to be to build a similar machine, but this will be a wet machine for the silicon carbide belts, but we will have to save up again to afford the expanding drums! I assume you are in the UK. so the other option is to give this chap a bell, his name is Roger, sorry can’t remember what his company name is, but his number is 0207 6184267, he supplied our last belts, his are called crystal belts, same thing just a different manufacturer. You can also get them from Santa Fe Jewelery supplies in the US //www.sfjssantafe.com/items.php?Gid=488&ItemSet=Lapidary&DepId=tools they are nice people but just drop them a line to get a postage quote. The other option is to go straight to diamond belts, but this would mean you machine would have to run wet, have a look here //lapidarytool.com/cart/lapidary/sanding-belt/diamond-resin-sanding-belt.html you need to keep clicking the little “more” icon and eventually the 8×3 belts appear, we have done business with this chap and he is good. Great article, just in the process of building my own machines. However I’m having problems locating REZ belts. Would be grateful if you could point me in the right direction. I’ve checked with Manchester Minerals and on ebay but cannot find 8″x3″ there or anywhere else. sorry for the late reply, anyway yes it is the same motor and pulley set up on both machines. Not sure about the v belt size, would need to check. I put the rez belts on their own drums so it made life easier so I could just move fro one wheel to the next, yes you could do what you are suggesting with two wet wheels on one side and two dry on the other side, but keep in mind if you need to change the inner belt on either of these wheel will it easily slide over the outer wheel as well, the reason I mention this is that some times the silicon carbide belts (the wet ones) can become tight on the wheel sometimes. First let me say what a great setup this and you’re previous cabbing machine are. Thanks for the detailed write up. New to the rock hobby so trying to set up as inexpensively as possible. Something like this would seem to be a good way to start. Couple of questions if I may. Did you use the same motor / pulley combo as on you’re ‘wet’ setup? What size ‘v’ belt are you using? Also the diamond impregnated Res belts, do these have to be on their own expanding drum or could they be changed as and when required? My thought is to have two wet wheels on one side with two dry wheels on the other. Lastly, if you were doing it again, would you change anything? Sorry to ask so many questions! There was only two in mind when I started, honest!! as all the cutting and initial sanding is done on the machine with silcon carbide belts which has a staedy water supply for cooling there is no dust, when we move onto the diamond wheels there is virtually no dust created as we are basically getting that final mirror polish and as such there is no apparent dust created. We only really see dust if we are using the small diamond discs but even then it’s kept to a minimum because of the water that’s flowing over the surface we are working on. How do you deall with the dust? Hey no problem George, it’s because of the very limited choice over here that we elected to build our own kit, yes it’s all a bit “Heath Robinson” but it does the job, the biggest problem is finding a machine shop to do any metalworking you might need, but the chap at ABC Polishing is very good and very reasonable. Our next project is some sort of flat lap or vibrating lap so we can get nice flats on the back of some of the rocks. I am very limited on space at the moment as I live in a flat, I hoping to move into more favourable accommodation next year. Unless you import or make your own choices are very limited in the UK. So its good to know I have larger choice of bearings than I thought. and thanks for stopping by, well the original machine with the tallboys is still running sweet after all this time, I guess this is partly due to the fact that the bearings are enclosed in the body of the machine sp no muck or water gets into them, to be honest I only oil them when I remember and the machine is well used. We tend to work on batches so when it’s running it’s on for mabey 6 hours constantly. The only real problem I had when I made the original machine with the tallboys was lining the bearings up properly on the base plate so that they weren’t on a slight angle and gripping the shaft, otherwise it’s all good, also looking back, at the time this shaft with the tall baoys was all we could afford but now there are many people offering sealed ball bearing relatively cheaply on Ebay and places like that and metal shafts aren’t to dear these days either which is great if you access to someone who can machine the shaft for you. I see that your new diamond unit is fitted with ball bearings and your previous one appeared to have the bronze tallboy type. Everything I have read about home made machines did not recommend the bronze type bearings saying ball bearing should always be used. If I am correct about the type of bearings used, how did they hold up? thank you for dropping by and your comments, we are working hard to try and get a good workshop set up so that we can produce some nice quality items. As we said in the post we were happy before with most of what we had made using cerium oxide polish, but the diamond paste has opened up a whole new world to us and this new machine has made the process quite a bit quicker now. The saw/grinder combo we have is an old PMR machine which was the first item we bought when we embarked on this adventure and it has served us well but it will be needing new bearing in the no to distant future as it “rumbles” a lot when it’s cutting, but that’s not too big a job to do. But to be honest with you Dave, we both love being out in the workshop and my wife, Shalini has become a real dab hand at the cabs now and she gets some great manicures at the same time as well! I think what we enjoy most is cutting and polishing some stones then in the evening wrapping them in wire to make a special piece of jewellery which we then show on our stall at craft fairs. I will drop you a line now from my own e-mail address and I look forward to hearing from you. Hi Dave, Have only just found your site.Excellent build that should give you many years of service. Enjoyed reading through your site as it takes me back over thirty years when I had a Lapidary business. That was when “Rock & Gem” magazine was still in publication who organized shows at various hotels in London. I still have my machines,12″ Evans saw,PMR 8″ double grinder and two 10″ Beach saws.Can’t remember how I did it but was able to power feed the Beach saws with the purchase of two motors, the type used on ovens to turn the spit. Unfortunately, at the age of 73 none of these are now operational. I looked at the picture of your saw & grinder combi unit,the grinder looks exactly like my double grinder cut in half and notice you use yours from the front, I used mine side on with 6″ diamond disks. I fitted a Graves preformer to the grinder,purchased from the USA as I only cut 40×30 calibrated cabs.This gave me a perfect oval that fitted the Caverswall silver pendant mount every time. You said you were saving up for some silicon carbide belts. If you can use flat diamond disks instead,6″ dia with 1/2″ centre hole that cost just under £9 each including postage let me know and I will email details. I have only used the 80 grit but found them very good value for the price. They come in 80-100-120-150-180-240-320-400-500-600-700-800-3000 all at the same price. Hope I haven’t bored you with all this as I have other things I would like to discuss privately with you.